• Skate in School is at the forefront of "New PE" initiatives, which boost youth fitness and self-esteem, and emphasize the development of life-long physical activities. • Program meets National Standards for PE. 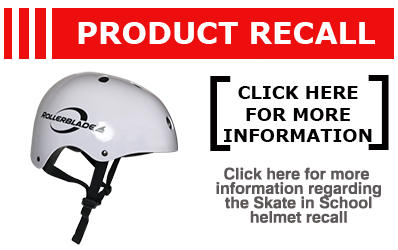 • Rollerblade¨ skates and protective gear at a special price, which schools purchase and own so teachers can use it anytime during the year as part of in-school and after-school programs. • Developmentally appropriate lesson plans and instructional DVD. • Optional in-service instruction for teachers and optional skate storage cart.